This past week, large parts of the country were affected by cold weather, snow and ice. We here in Northeast Ohio were no exception – we were lucky enough to get a second round of polar vortex chilling temperatures. 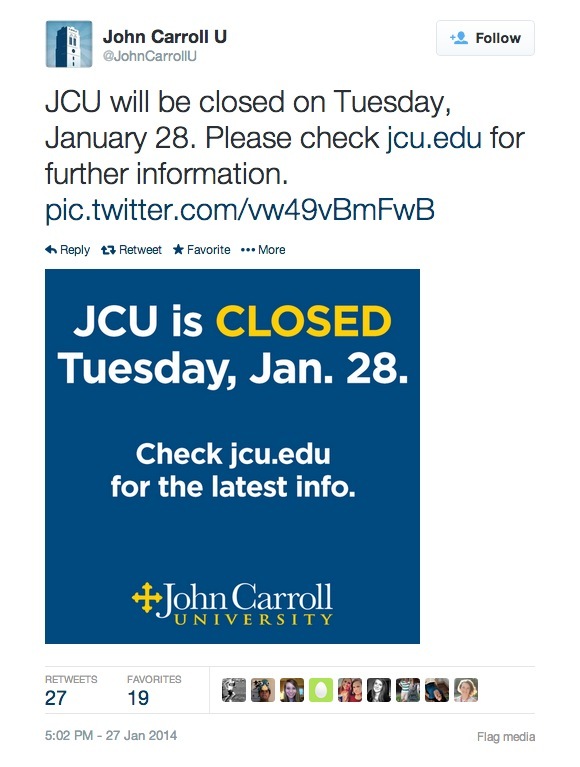 One of the fun parts of my job is monitoring social media, and Monday afternoon we started getting bombarded with tweets from students asking if we were going to close because of the weather and cancel classes on Tuesday. 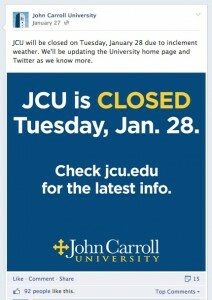 As more and more local colleges and universities started to close, the tweets increased, calling for us to close. I did my best to respond, saying that as soon as we heard from the administration about our status for Tuesday, we’d announce it via email, web, text message and social media. At one point, we had to deal with a student who changed his name to John CarrollU and stole our avatar and started posting messages that the University was closed. 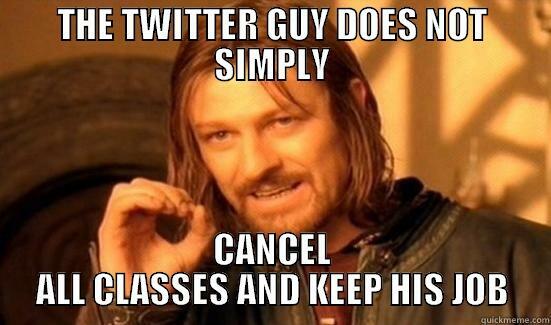 After I noticed a few retweets of that story, I had to @ message him to cease, take down the tweet and change his icon. Luckily, he did. To be safe, I sent this message out. I’m happy with the results – I think the only thing I’d add next time is also posting this to Instagram. We have a lot of students there and it’s a great visual medium especially with the quick scanning you do there. If social media isn’t part of your emergency weather communications mix, it should be.